Mark Grenon just finished serving breakfast to over 1,000 hungry people—but the Moorestown McDonald’s franchise owner wasn’t working at his bustling restaurant at the corner of Lenola Rd. and Camden Ave. Every year he donates all the pancakes and supervises the food preparation for the Rotary Club’s Pancake Breakfast. In the spring he does the same for Moorestown Baseball Federation’s Breakfast, and he’s been providing this service for these organizations for 21 years. It’s his way of connecting with and giving back to the community that has supported his business for decades, and as the proprietor of a restaurant that has food preparation and service down to a science, he’s up to the task. Grenon started working in a McDonald’s while he was in high school in Edgewater Park, continued to work shifts while he was going to Rutgers, and at the age of 30 he purchased his first franchise on Torresdale Avenue in Philadelphia—an outlet he still owns. In 1994, he bought the McDonald’s in the Moorestown Mall, and a year later he took ownership of the franchise on Lenola Road. As shopping patterns shifted, he decided to close the mall location in 2010 and invest in a complete renewal of his restaurant in the historic Lenola section of Moorestown. In 2011 the original 1967 structure was razed, and taking its place was a bright modern building that continues to draw about 1,000 diners a day. Grenon just opened another McDonald’s on Rt. 38 and Coles Avenue, but he maintains that the Moorestown location will remain his favorite because of the sense of community that he enjoys there. Grenon says the signature hamburgers and fries are still a mainstay, but many people stop in for the variety of salads and healthy breakfast items, or a trip to the McCafe machine for specialty coffee drinks and smoothies. The location is convenient for residents and commuters, whether they’re ordering from the drive-through window or using the free WiFi as they enjoy their food. Grenon is proud to be a part of an organization that values quality and innovation, and looks forward to continuing to provide Moorestown residents of all ages with great food and service—and to flipping thousands of pancakes for the good of the community. Moorestown Business Association initiated its Spotlight program in 2015 as a means to highlight local businesses that are making a positive impact on the community. The MBA is recognizing the restaurant and its owner for 21 years of business leadership and community support. 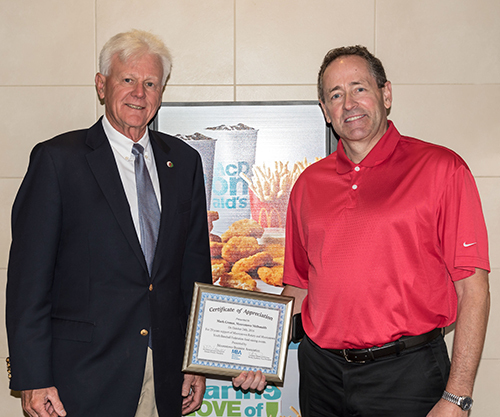 Photo (L to R) MBA President Don Powell and Moorestown McDonald’s owner Mark Grenon. Photo credit: Tom Sheckels.